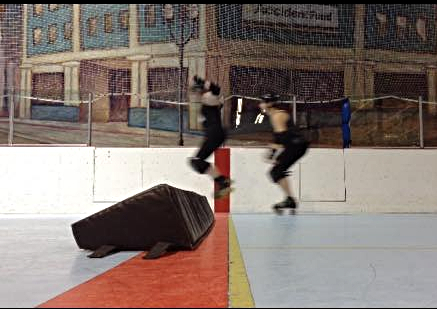 Roller Derby Boot Camps and Basic Training Start Soon! Do you want to become a Vixen?! Learn more about the great sport of roller derby and learn basic skating skills at one of our Recruitment Boot Camps! Our Recruitment Boot Camps will get you ready to start Basic Training in October. In order to go through Basic Training and become a Vixen, you must attend at least 1 Boot Camp. Boot Camps are $15, but if you attend 2 Boot Camps, the 2nd one is only $10! If you attend 3 or more Boot Camps, the cost for your 3rd-5th Boot Camp is only $5 and you’ll be SUPER prepared for Basic Training! You do not have to have your own gear to participate in a Boot Camp, but you will need your own mouth guard. Check out Modern Skate & Surf in East Lansing for your gear!They are located in Downtown East Lansing at 319 E. Grand River. Have more specific questions? Just send us a message or email info@lansingderbyvixens.com! Wendy (Ariel Attack) Litwiller will be leading our Boot Camps and Basic Training programs, so please add her on facebook for more information and for updates. Mark your calendars with these dates! Basic Training starts October 4, 2015(time and cost to be determined). Would love information on your boot camps! Talked to a few of the members and it all sounds like a riot!